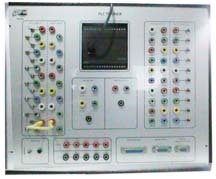 SALIENT FEATURES : Programmable Logic Control Trainer is a versatile training system. It is a unique modified version of an industrial PLC. It is designed in a manner to provide best training in a cost – effective manner. Various instrumentation / mechanical and control jigs / modules are provided along – with the trainer for explaining and performing various applications using a PLC. The main PLC unit is of modular construction, for ease of connection and operation. The program is built – in with computer support. Facility to cascade timer and counters. PLC unit of modular construction. I / O Capacity : Analog : 2 channel, 2 input + 1 output. Digital : 14 channel input + 10 channel output ( optically isolated ). Input Voltage : 24V DC for relay operation. Indication : Input : 8 LED indication on panel. Output : 8 LED indication on panel. CPU / Memory : 8 bit Micro – controller with RAM & EPROM memory. IBM PC Link : UP / DOWN loading from PC through RS232 link. Software : Documentation support software on CD (With ladder diagram programming software). b. LVDT with lead screw arrangement ( motorized ) module. c. Conveyer belt, level control module. d. Temperature Heater module with thermocouple transducer. e. Pick and place Robo Module with stepper motor. g. Signal Conditioning module with thumb provided Wheel Switches. Stepper motor speed and direction control. Lamps ON / OFF control. LVDT Control. Automatic / Electronic Control. Water / Fluid Level Control. Thumb – wheel Scan and Display.